 Control android remote camera by using WiFi-Direct Mode. No wifi network is required to use WiFi-Direct options. More distance could be corvered than the bluetooth mode could corver. 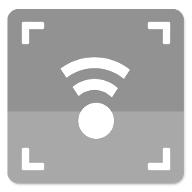 After WiFi-Direct connection, for the Remote Mode, use WiFi Connection Screen to connect camera mode. 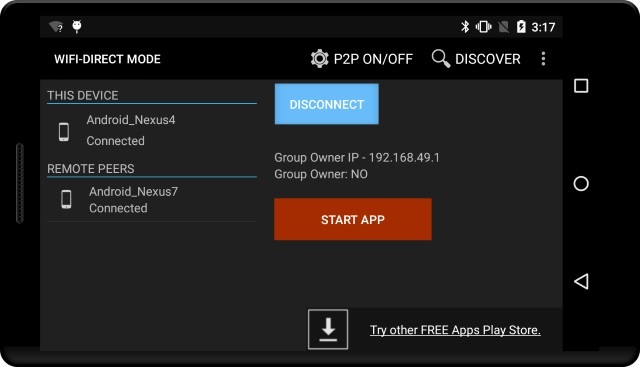 Note: Android sample app (WiFi-Direct) is based on the connection. Even though the WiFi network is not required, the WiFi must be turned on before using the WiFi-Direct mode. 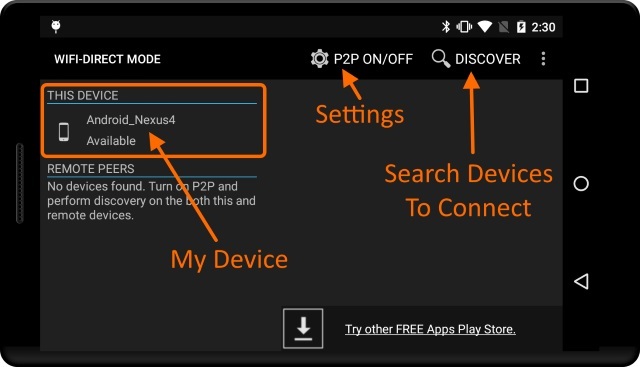 To search remote peer devices, click Search (Discover) menu on the BOTH camera and remote devices. 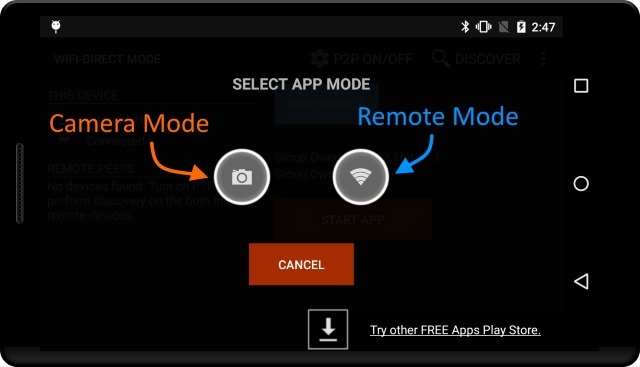 To start camera or remote mode, click Start App button. Start Camera mode first, then start remote mode on the other peer device. 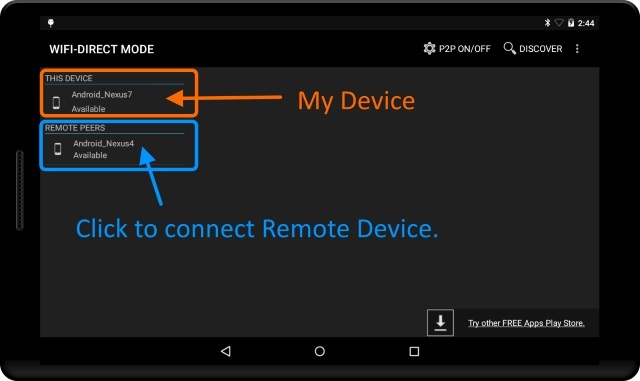 To connect remote camera device, open WiFi Connection window from remote mode. 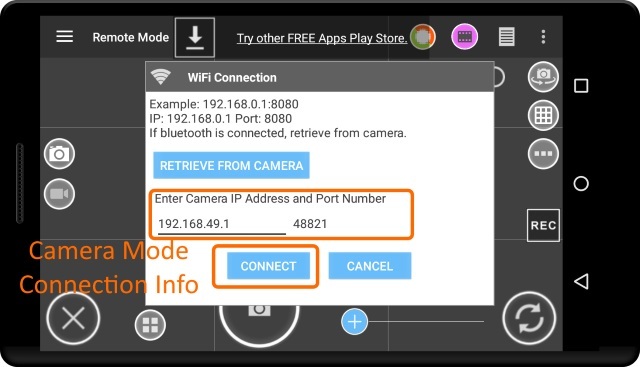 The camera device IP and PORT number will be automatically placed, do not need to retrieve them again. To see if WiFi-Direct mode is available on the devices. 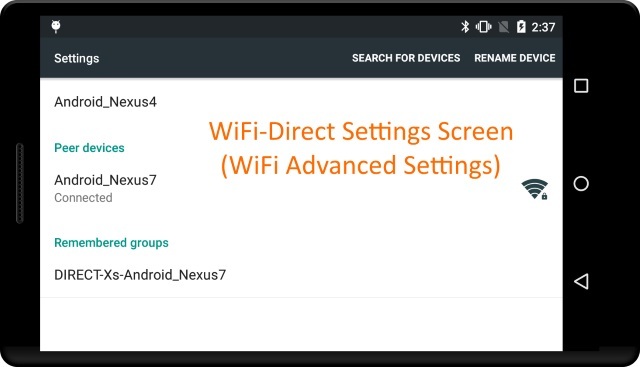 WiFi-Direct setting is at the WiFi Advanced Settings on the Nexus devices. Other OEM device, user may have to turn On the WiFi-Direct mode manually. Even though the WiFi network is not required, to use WiFi-Direct mode, WiFi must be turned on before using WiFi-Direct mode.